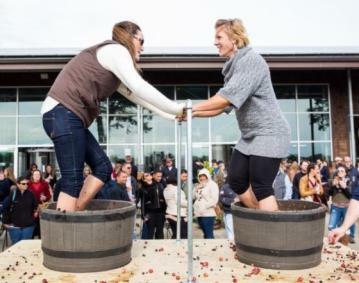 Two days full of grape stomping, wine AND Taproot beer tasting, pie eating goodness. Enjoy live music, while sipping on our local wines or fresh Taproot beer, and noshing on food created by scratch from our culinary team. Feeling competitive? You could be called to compete in our Grape Stomp Competition OR our Pie Eating Contest! Ongoing from 12:00 p.m. - 5:00 p.m.
*Grape stomping and pie eating contest contestants will be selected at random the day of the event. Please be present and dressed accordingly if you want to have a chance at participating.